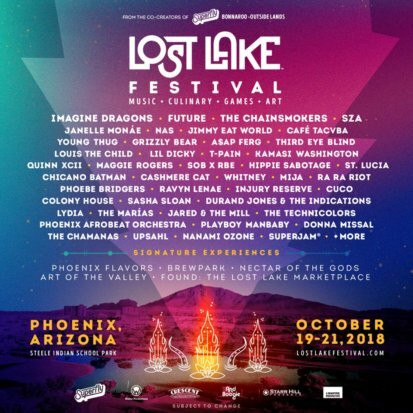 Lost Lake Festival just annouced their lineup for 2018 and I’m stoked! Headliners include Imagine Dragons, Future, The Chainsmokers and SZA, as well as Janelle Monáe, Nas, Jimmy Eat World, Café Tacvba, Young Thug, Grizzly Bear, A$AP Ferg, Third Eye Blind, Louis The Child, Lil Dicky, T-Pain, Kamasi Washington, and many more. This is such an amazingly eclectic blend of music (which will include more than 40 acts) and I can’t wait! Additionally, Lost Lake will bring to life an all-new SuperJam featuring a curated group of artists and musicians who will perform together for a once-in-a-lifetime collaboration. A celebration of the Phoenix community, this three-day festival will be held Oct. 19-21, 2018 at Steele Indian School Park in Phoenix. In its second year, the festival will once again celebrate the Valley of the Sun’s vibrant culture through music, locally-driven culinary treats, interactive games and inspiring art experiences. Needless to say, Lost Lake is a truly unique event and I couldn’t be more excited! Learn more at LostLakeFestival.com, on Twitter @lostlakefest, Facebook @lostlakefest and on Instagram @lostlakefest.